Overview: Are you ready for something different? If so, then dive into this volume as we follow the adventures of the offspring of Satan. First up is Daimon Hellstrom, a learned scholar who specializes in the occult. However, when the cases get dangerous, he changes into his Son of Satan persona. Armed with a trident and possessing the power of the Darksoul, the Son of Satan fights many of the lesser demons of Hell looking to gain favor with Daimon’s father. 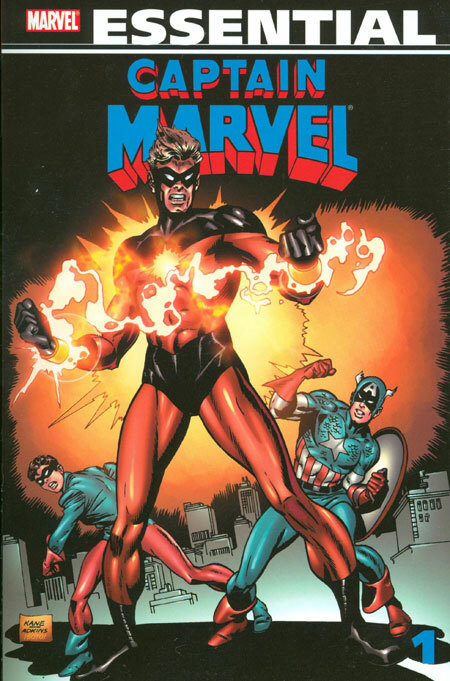 Daimon’s story ran through Marvel Spotlight before he graduated into his own short-lived title. Also debuting at the same time is Daimon’s sister, Satana. The two siblings were separated as kids following their mother’s death and raised completely different. Satana embraces her heritage more than her brother. Satana feeds on the souls of men, which she absorbs by kissing them. When she finishes, the man collapses dead and a butterfly is released. Satana’s story jumped around between various Marvel/Warren magazines before it comes to an end in the pages of Marvel Team-Up. Is this the end of Satana? Time will tell…. What makes this Essential? : I’ve got mixed opinions on this book. 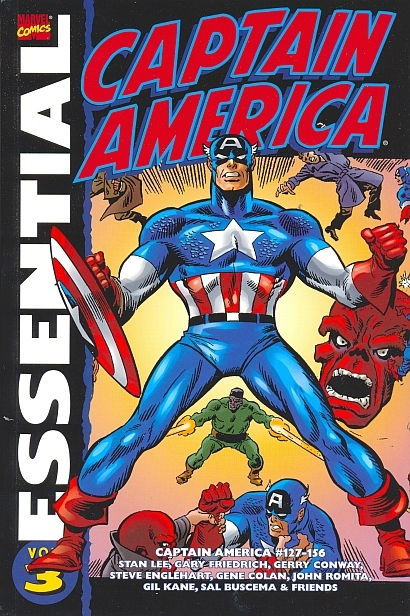 Most Essentials follow a character through the run of their book, and will include any additional appearances in other titles. So while this is titled the Essential Marvel Horror Vol. 1, it could better be named as Essential Son of Satan & Satana. But I don’t know if that volume would have sold. So, for following the adventures of these two characters, this is a serviceable volume if you are fans of the characters. I found the Satana stories more interesting, being a mix of illustrated tales and prose pieces. 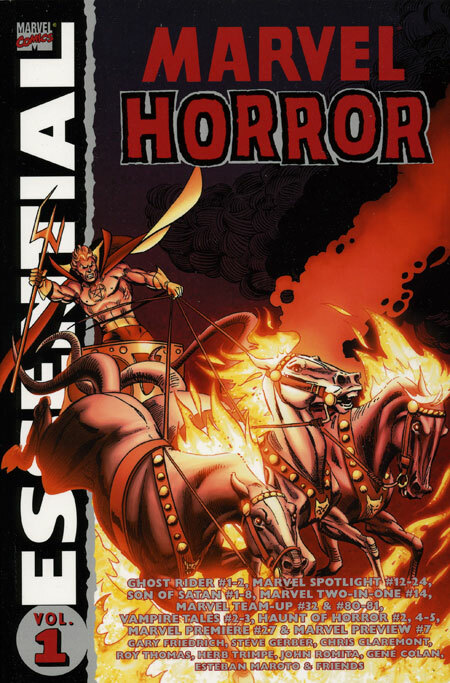 But personally, after seeing the Satana stories from Vampire Tales and Haunt of Horror, I would much rather see Essential Marvel Horror collect the entire run of those magazines in a volume. There are a lot of Marvel/Warren magazines that have not been reprinted, and the Essential line would be the perfect place to present them again. 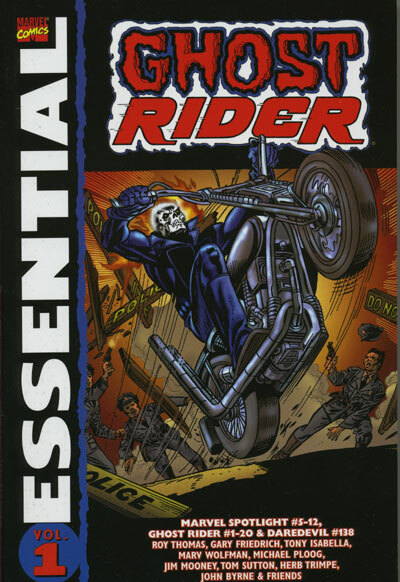 Footnotes: Ghost Rider #1 & #2, and Marvel Spotlight #12 were also reprinted in Essential Ghost Rider Vol. 1. 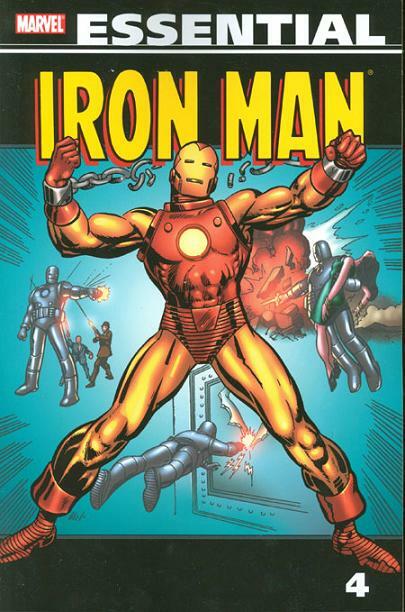 Marvel Two-in-One #14 was also reprinted in Essential Marvel Two-in-One Vol. 1. Marvel Team-Up #32 was also reprinted in Essential Marvel Team-Up Vol. 2. 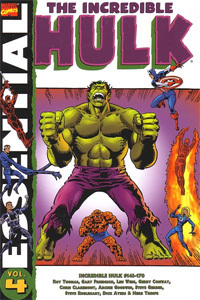 Marvel Two-in-One #80 and #81 were also reprinted in Essential Marvel Team-Up Vol. 4. If you like this volume, try: the Rachel Rising series from Terry Moore. For me, the highlight of this entire volume is ‘The Kiss of Death’ story from Vampire Tales #3. Gerry Conway’s script is good, but the artwork by Esteban Maroto steals the show. This story is breathtaking and worth the price of the Essential just to read this story. For those unfamiliar with his work, Maroto is a Spanish artist that did a lot of work for the various horror magazines of the 1970s. He helped design the metal bikini for Red Sonja with her debut. He also did an Amethyst mini-series for DC and a story in an X-Men: Unlimited issue for Marvel. Maroto’s female forms are exquisite, ranking up there for me with the likes of George Perez, Phil Jiminez, Adam Hughes, and Terry Moore. Since the early days of Moore’s Strangers in Paradise series, his female characters have jumped off the page, laughing and loving and living. In 2012, Moore launched his first horror series with Rachel Rising, about a young woman waking up one morning dead, but she remembers who killed her. Over the series, other friends die but remain alive; deals with the devil are made, and a mystery dating back hundreds of years is slowly revealed. This is some of Moore’s best work ever, and you are missing out if you’re not picking it up every six weeks. The early issues are collected in trade paperbacks to bring you up to speed with one of the best (and creepiest) books on the market today.